I heard my five week old son laugh for the first time this week. It was one of the sweetest moments in my life. I thought of you and of all of us, savoring all that is new and emerging with inspiration and beauty at this time. I also heard him cry/wail/scream with a fervor where I felt my heart break in helplessness. I thought of you and of all of us, honoring all that is painful, evoking grief and in need of healing. Then I thought of the equinox, of the equal day and night, and how our lives are initiated by an infinite cycle of blessings and challenges. While we may be aware of the cyclical nature of our lives, have we lost sight of the epic possibilities of what we are being initiated for? What is the most hope that you can hold for humanity? During the turning of the ages, what tools have we found to guide our way to truth and beauty? My prayer has always been that Qoya and the practices of embodied presence in movement, ritual, community, and pilgrimages can be like a rainbow bridge from the wisdom of the body to the wisdom of spirit, again and again. Qoya is based on the idea that through movement, we remember. We remember that our essence is wise enough, wild enough, and free enough to transmute all that crosses our path into learning and love. Through showing up to the mystery school each and every day that is life, we get more and more clarity on the intersection of our greatest joys and brightest talents, and the places where they have the most positive impact. Where our hope can be made visible in the world through inspired action. Do you remember how to remember? Do you know how to consciously cultivate and curate moments where you feel the physical sensation of truth and resonance dance along your bones and breath? Are you interested in exploring the part of your heart that is ever resilient? Would you like to know the impenetrable sacred spot in your soul where hope springs eternal? If so, this full moon could illuminate what you see. The Full Moon in Libra, March 20, 2019 (9:42pm EST), is on an equinox. Equal light and dark. This Moon is a dawning. A becoming. A starting point covered in flowers. The air is fresh and reviving, drenched in fragrance, coaxing us back to life. Break through the soil of the previous season. Unfurl, arise, and begin again. The internal becomes external. What has been gestating within you? Allow it to emerge in a surge of energy. Confusion becomes action. Reflection becomes expression. Show yourself. Without hesitation, when it’s their time, buds unfold into blooms. Now’s the time. Just as the blossoms do, bring forth what is within you. Unapologetically. Without fear. This is You, bursting open in the raw, sensual loveliness that is your birthright. Healing, reclaiming your identity, and calling for what you want. Don’t just share your beauty - assert it. Uphold it and declare it. Live into it. Make it stronger and bolder. Set your beauty alight, and let it be a vivid affirmation for others to live into themselves. The world is a looking glass. Gaze in the mirror, and learn how to love what’s reflected. Come into relationship, each constituent element strong within itself, co-creating harmoniously. Appreciate all the beauty you can see emerging now, its infinite forms reminders of inexhaustible abundance. Encourage it to come forward with more confidence. Whisper sweet nothings to it, yield to it, and watch it grow. Be the New Beginning, rooted in pleasure. Meet others here. Share in this initiation. Join the confluence of energies making more love and grace in the world. Wayfinders of restoration. Warriors of the New. Accomplices to peace. Architects of harmony. Artists of equilibrium. Life's lovers. I am so grateful for Virginia's words that stir the psyche to reimagine how to relate to this moment and to this moon. Read the words again and again and notice how they inspire your spirit. I also invite you to embody what this means for you. What does it mean to you and to your life for you to be vulnerable enough to let the sincerity of your hope emerge? Like a newborn baby's first smile, where is the origin point of the hope and trust that you came here with? How do we all begin again and again? I continue to find myself and reclaim my connection through the consciousness and community of Qoya, time after time. It's the easiest way for me to feel non-linear guidance that resonates with my soul, and it's how I can bypass the limitations of my mental conditioning and align with the bigger dreams of my spirit. That's why I'm always encouraging others to see if the practices of Qoya movement, ritual, connecting with community, and pilgrimages or sacred travel can be medicine for them, too. This weekend is the beginning of the 10 year anniversary celebration of Qoya at the Collective Retreat in Costa Rica. This video captures how it feels when I am able to touch the place within me where hope springs eternal. The invitation in the video is to dance in a way that inspires you to remember the place inside of yourself that has an impenetrable hope. How? 1) Find a place that you love to go to dance. I'm not able to go to Costa Rica physically this year, so if you can't go far physically, pick the best place available to you and explore also traveling in your imagination! 2) Choose music you love and movements that feel good in your body. 3) Honor what emerges, and notice what is the most important to you and your embodied soul. 4) Savor the physical sensation of truth and resonance each and every time that you feel it. 5) Support others on their path, for we are all interconnected. *For those who would like to be led in movement in a more structured way, visit our movement video library to select a movement ritual whose theme resonates with you today. I have always been inspired by the Qoya community in New Zealand for the ways that they courageously show up authentically and hold space for others to feel and express, and in the integrity of that expression, heal. They have donated the proceeds of their 10 Year Qoya Anniversary classes to the victims funds. If you would like to join them and me in doing the same, click here. As we explore our relationship to the energies of this full moon and this equinox, I invite you to notice in your own life: when the hardest days arise, how do you maintain the courage to hope and to let that seed of faith take action? I think of the advice given by Islamic scholar and mystic Rumi, "Wherever you stand, be the soul of that place." I'm sure he wouldn't mind if we added, "Wherever you dance, be the soul of the place." May we each remember our capacity to be a loving embodiment of hope, soulfully standing in the places where we are. Ten years ago, March 1st, 2009, Rochelle taught the first Qoya class in New York City! This month there are Qoya classes celebrating the 10 year anniversary in over 50 cities around the world! This year's Collective Retreat in Costa Rica is also a celebration of 10 years of Qoya, celebrating the connections made to our bodies, to each other, to nature, and to spirit. Click here to find a class near you and click here to learn more about the Collective Retreat. 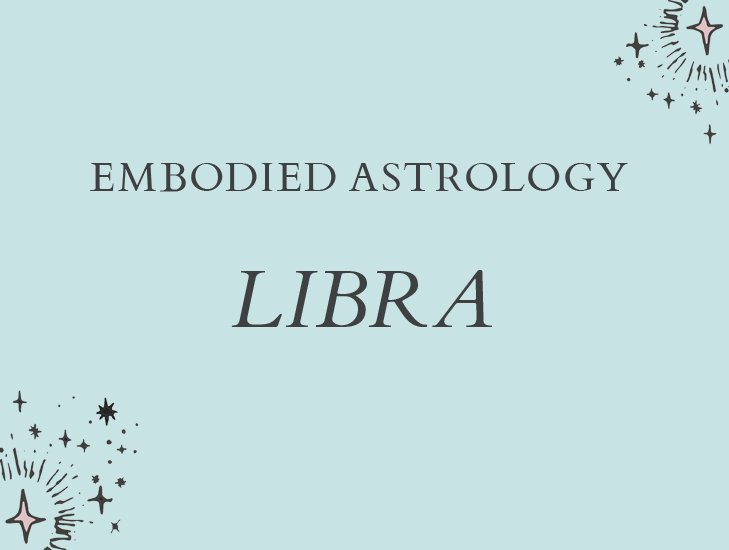 To continue diving into the energy of this Libra moon, you may also be inspired to check out the Embodied Astrology: Libra course which includes an introductory video to give you an overview of Libra's aspects, a Qoya Movement Ritual so you can embody your own personal relationship to Libra, an integration video with an exercise to apply in your life, worksheets with journal prompts, and a blessing for deep reflection. Enrollment is now open for a Qoya retreat with the theme Wise, Wild and Free led by Rochelle Schieck at the beautiful Multiversity Retreat center in Santa Cruz, California.